The 2nd Annual Masons Midsummer Meltdown returns to Wyandotte County Lake Park this Sunday. Look for several new trail sections at this years event - a nice climb up OZ has been added along with some new more technical sections added to the course to make it a true cross country classic. Do not forget to check out the event flyer below. Start times are 9:00 am and 11:00 am - see flyer for details. Looking to pre-ride the course before the event? This Wednesday evening is your chance. Click on the Course Map link below for details. 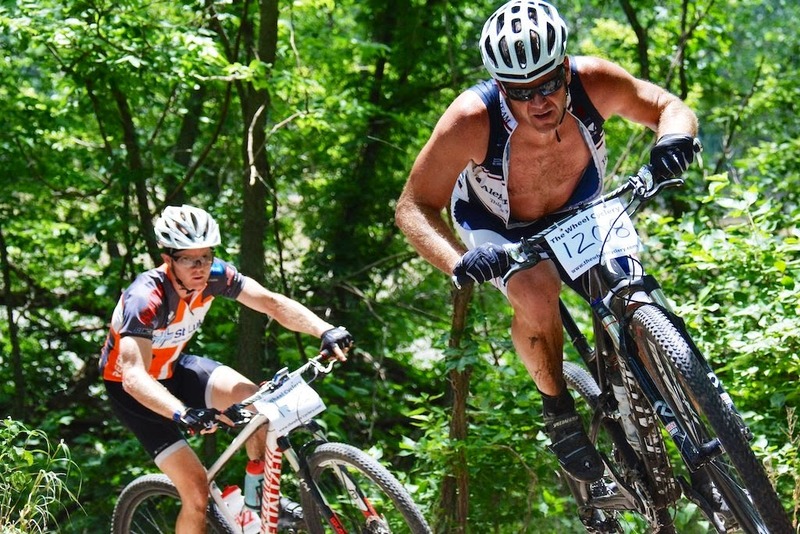 A local mountain bike classic for over a decade, this years God's Country race was awarded the 2014 Kansas State XC Mountain Bike Championships. Normally held in March/April on the Lawrence River Trails the event was moved to June and made a qualifier for the National Mountain Bike XC Championships. Tropical heat greeted the nearly 150 racers as they not only battled each other but the course and heat. The key to the day was to maintain a steady pace and keep the breeze flowing over your body to cool you off. Tori Brocket demonstrates perfect form. Another way to stay cool on the day was to enjoy some of Carolynn Locke's melons. Her melons were really tasty on this day especially with some salt. 10 ice cooled water melons were consumed on the day. If melons were not your thing we had some tasty donuts. Our first class to take on the trails and the heat was the Marathon division. Great rides by all the participants. Class leaders Kent McNeill and Lyle Reidy had a great battle. Kent made the trip down from Nebraska pay off and took the top spot on the podium and finished with 5 laps - 50 miles. 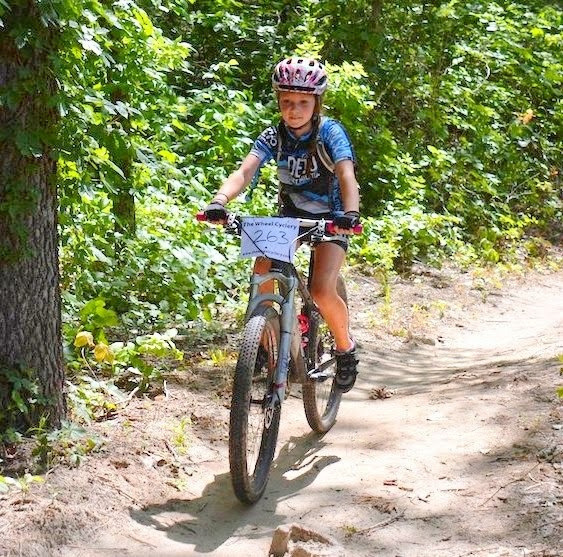 It was good to see so many juniors out having fun racing their mountain bikes, especially the little women mountain bikers. 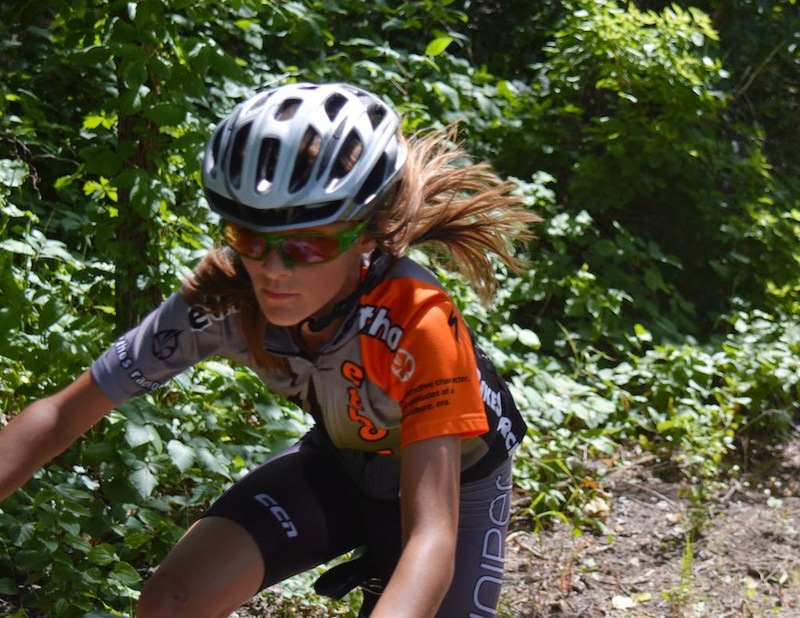 The future of mountain biking is with them. The start was up on the Levee. Each group started in minute intervals. For some the effort to get the holeshot and lead into the woods is worth the effort. Others paced themselves in the heat and slowly worked their way up through the fields. We had all kinds of bikes on Sunday. 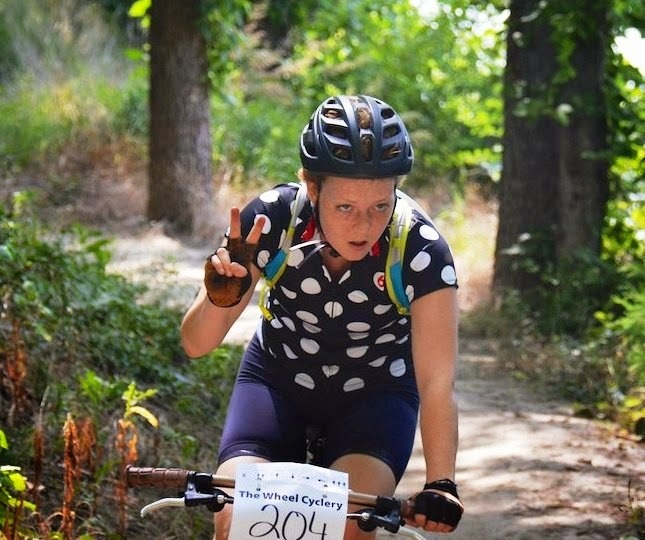 MTB's, Fat Bikes, Single Speeds and Cyclo-Cross bikes. Chris Thomas demonstrates the proper form on his Cross bike. There is debate in the mountain bike world as to which wheel size is the best. After Tige Lamb set the fastest time of the day and won his 3rd straight mountain bike event on his new Giant 27.5. Word is J.P. Brocket is turning his back on the 29er world and joining Tige on a 27.5. Without all the volunteers this event would not have been possible. A special Thank You goes out to Lawrence Mountain Bike Club for getting the trails ready for Sunday's event and members of both the The Wheel Cyclery and Cow Town Cycling Team along with the Midwest Mountain Bike Patrol for giving up your day to allow us mountain bikers a chance to have fun. Until Masons Midsummer Meltdown . Peace out.